A salmonella outbreak has led health chiefs to identify an unexpected source of the bug - lettuce. 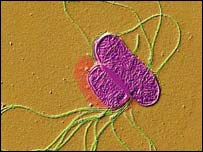 The bacteria have claimed 144 food poisoning victims throughout North East Lincolnshire in the past month. Environmental health officer Steve Mercer said: "We have pinpointed the source as lettuce, which has never been regarded as a high-risk food. "I am not aware there has ever before been an outbreak of this size associated with lettuce." Mr Mercer believes contaminated lettuce is responsible for similar, although smaller, outbreaks in Birmingham, Coventry, Northern Ireland and the Isle of Man in the past few weeks. He is writing to the Food Standards Agency (FSA) to advise them to issue national guidance on the storage and handling of lettuce, particularly in fast food outlets, where the North East Lincolnshire cases all started. "We would not want people to stop eating lettuce at home," he said. "The problem seems to occur in certain fast food outlets where lettuce is left lying around on display in high temperatures. "We now believe there may be some multiplication of the bacteria in that environment." The FSA and Health Protection Agency are currently assessing the cases. "We have just had our final outbreak control meeting," said Mr Mercer, whose team have been working round the clock for the last month to identify the source of the illness. "The last new case in this area was on 14 September," he said, "so we have decided that this outbreak is over."